I deeply believe the most valuable currency in today’s workplace is meaningful work, not just a paycheck. In April of 2000, I became a founding member of a job board called Jobing.com. Over an 11-year period, I helped build the company from 5 employees and a few thousand dollars in revenue to nearly 400 employees and $38M in revenue – the secret to our success was hiring people who aligned to our purpose and values. I consulted with nearly a thousand employers on their employment brand, employee value proposition, and employment advertising strategies. Through this experience, I saw first-hand the power of values, the power of culture, and the power of unwavering purpose – when done right, it was the ultimate competitive advantage. 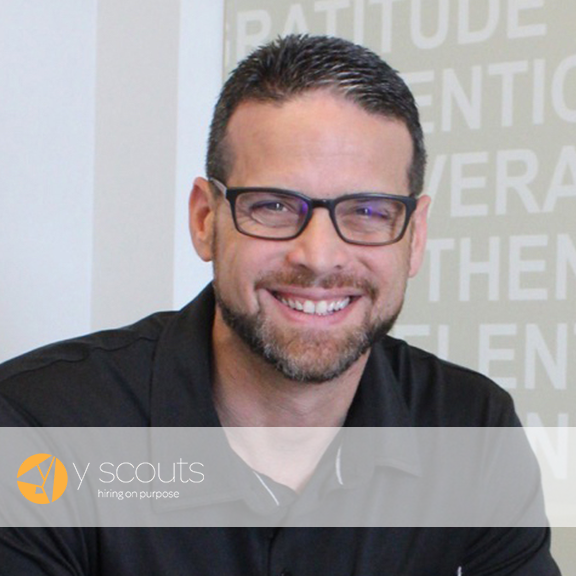 I started Y Scouts with the belief that today’s leaders must authentically connect to the purpose and values of the organizations they lead. If disconnected, the strength of their experience (i.e. their resume) will only compensate for so long. With more than 70% of the workforce unhappy with their work experience, and the associated half trillion loss in productivity this disconnect yields (not to mention the host of additional ripple effects), there has never been a more critical time to re-examine how we find and connect the right leaders with the right companies. I joined the board of Conscious Capitalism in January of 2016 to more fully engage with other leaders who are making a meaningful difference. When I’m not focused on transforming how people and companies connect to work that matters, you will find me spending time with my wonderful wife of 17 years and 2 gorgeous daughters. I’m also guilty of spending my free time learning to play guitar, perfecting my Texas hold ’em skills, and traveling to see my favorites musicians and bands.